KDE Konqueror is much more than a file manager. It is also a standards compliant web browser. Here is a neat trick to surf the web sans the mouse - that is, using just your keyboard. Fire up Konqueror in Linux, FreeBSD or what ever OS you are running that has KDE installed. Konqueror usually opens in File browsing mode. 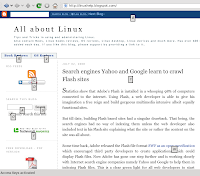 Type in the address of the website you wish to view, in the Address bar - for instance http://linuxhelp.blogspot.com and press Enter key. Here is the interesting part ... Once the website loads itself, tap on the 'Ctrl' key once to activate the "Access Keys" and Konqueror will label each link in the web page with unique alphabetic characters. You can follow the link in the web browser by just tapping the corresponding character associated with the link. Tapping once more on the 'Ctrl' key will deactivate the "Access Keys". Strongly related to this trick is the nice X.org "Mouse Keys" feature. After enabling via Shift-Numlock, you can use the keypad cursors for mouse pointer movement. Very helpful in case the mouse cord or buttons are broken _again_. Look, Ma, no mouse any more at all!